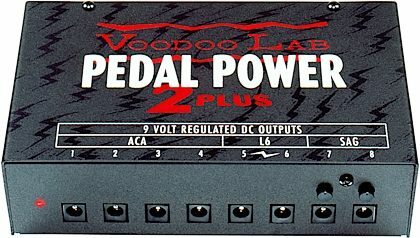 The Voodoo Lab Pedal Power 2 Plus Universal Power Supply is the ultimate solution for powering your pedalboard and other outboard FX processors! You'll enjoy clean, filtered power via 6 x 9VDC 100mA and 2 x 9VDC 250mA regulated sources -- and clean power means better sound. The beauty of the Power 2 Plus: all of the power outputs on this baby are completely isolated from each other. This means that you'll encounter no tone loss or power drain between different devices. With a Voodoo Lab Pedal Power 2 Plus powering your pedalboard, you can know that your outboard FX are running their best and most balanced. Moreover, you'll know that your rig is safe from unexpected surges or any "dirty" power you might find out there. You'll notice that the front panel of the Pedal Power 2 Plus is divided in ACA, L6, and SAG sections. The 4 outputs in the ACA section each deliver 100mA appropriate for 9V battery-operated pedals. These can also power Boss pedals that require the ACA adapter and operate at 12V. Just flip the switch on the bottom of the Power 2 Plus to change from 9V to 12V on any output! The "L6" section refers to Line 6 units, and delivers the 250mA that will allow you to run devices like the Line 6 DL4 Delay Modeler. Standard 9V effects will run from these outputs as well, if you like. The 2 x Battery SAG Control outputs each offer 100mA of power, but also allow you to "SAG" the voltage from 4V to 9V. This feature can be enabled via the bottom panel switches. This feature is there for the most die-hard tone freaks, allowing you to experiment with the power input behind your distortion pedals, to simulate the "dying battery" tones that so many guitarists swear by. Most of the noise and hum musicians encounter onstage or in the studio is caused by ground loops. 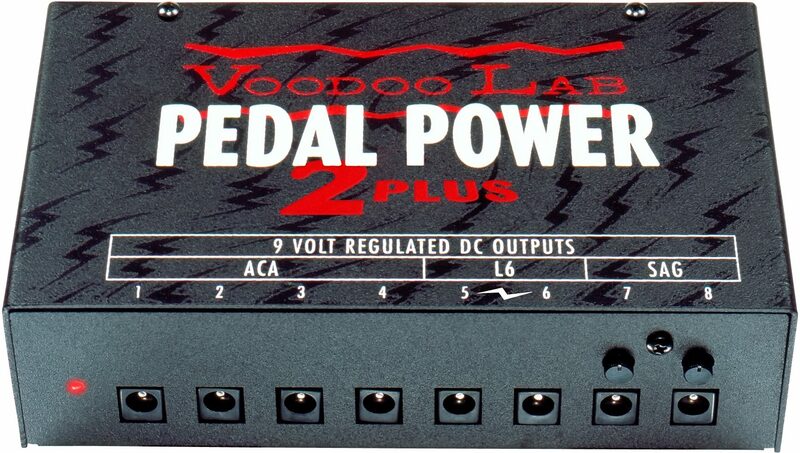 With its isolated outputs, the Voodoo Lab Pedal Power 2 Plus breaks unwanted ground paths before they even form. Meanwhile, the Pedal Power 2 Plus employs a specially designed, ultra-low noise toroidal transformer. By placing separate balanced windings on each of the 9 outputs, the Pedal Power 2 Plus eliminates the magnetic field noise caused by most standard "wall wart" power adapters. Any power supply can only be as good as its own power input, right? The exceptionally clean sound you'll hear coming from the Voodoo Lab Pedal Power 2 Plus owes to its use of an audiophile-grade linear power supply that prevents the transient noises and hum caused by standard "switching" transformers. The Voodoo Lab Pedal Power 2 Plus is handmade in the U.S.A. and comes complete with connection cables, a detachable AC power cord, and a 5-year warranty. zZounds is an authorized dealer of Voodoo Lab products. Voodoo Lab Warranty ﻿Voodoo Lab offers a full five-year warranty on their products. Filter, regulate, isolate, and protect! Pedal Power 2 Plus does it, and does it well, because any less will degrade your pedal's performance. Players everywhere upgrade to Pedal Power 2 Plus because it powers what conventional power supplies can't. Pedal Power 2 Plus is hand made in the U.S.A., comes complete with cables, detachable AC power cord, a 5-year warranty, and simply makes you sound better. Ground loops cause hum, and the solution is to break the unwanted ground path. Isolation is the best way to do it. Unlike other power supplies, Pedal Power 2 Plus isolates every output. This eliminates tone robbing interaction between units. Now you can properly power everything from vintage overdrives to modern digital marvels that others just can't. Switching power supplies aren't for everything. What's good for charging a cell phone is NOT good for your pedals. While digital switching power supplies are small and inexpensive, they also generate unpredictable transients and extraneous noise. Pedal Power 2 Plus uses an audiophile quality linear supply for consistently stable, clean, pure power. These outputs each have an available 100mA of power, but also allow you to SAG the voltage from roughly 9V to 4V. This feature can be enabled via the bottom panel switches. The SAG control is mostly useful for transistor-based fuzz, octavia, and distortion circuits, as most modern opamp designs are minimally affected by variations in supply voltage. We recommend turning SAG off if you're going to run digital pedals like delay, chorus, and reverb. The staple for pedalboards everywhere, this power supply is incredibly useful and powers a variety of different pedals -- even with different voltages. It even includes 2 outputs that simulate the sound of dying batteries in pedals for an added bonus. If you have several pedals and don't want to worry about your batteries dying in the middle of a gig, then pick this one up. Sound: Sounds Great. Very Quiet. I don't regret it. It consistently powers my pedals right regardless of whats around me. If I'm using single coils or humbuckers, playing with my tv on or by a computer. It keeps things quiet. Feature: This thing can power anything. Read the manual, tells you how to power n get more voltages and what not. If you need some extra cables or more different ones, you'll have to get them or an adaptor or whatever. That's its only downfall. But then again, how would they know if you're using a bunch of specially powered pedals. Better than a 1SPOT any day, neater too. Ease of Use: Its easy as connect your pedals if youre using standard 9V pedals like boss. Quality: This thing is a brick. Literally a brick. You see, feel, and hear the quality. Super reliable. I mean you already spent a small fortune on your pedals, so don't skip out on what powers them. Spend the extra cash, it'll outlive what you paid for it no matter what. Value: I didn't think it was worth $170 in the beginning. But when I hear the noise from before and after. The cost of me using batteries would've passed $170 a long time ago. Manufacturer Support: No need to contact them. It was great out of the box. The Wow Factor: I don't regret it. I do wish it was cheaper, but I'm glad I got it. It went with my pedaltrain perfectly as they said. My pedals are super quiet, and protected. Plus, if a gig place doesn't have good electricity or the power goes this thing will keep them running and sounding right and protect them. I think a piece of mind and consistency in the long run make this power supply better than the others. Overall: I'll start this off by saying this is one of the few supplies that ISOLATES EACH AND EVERY PEDAL, and protects them. This thing makes pedals quiet. I had a boss eq pedal and an ehx small clone that made noise with my 1SPOT while they were off. This got rid of all of the noise. A little comes through when my Small Clone is on, but not as bad as before. Thats just a noisy pedal anyways. Everything else on my board is silent on or off. It comes with enough cables but make sure you know ahead of time what type of pedals you're using and how much voltage and current they're because if you are using a bunch of pedals with random plugs like certain EHX n Line 6 pedals, you'll have to order some cables for those. This thing is super versatile. Especially the Sag voltage feature. Thats what made it worth it. It mounted perfectly under my pedal train 2 (took a couple tries drilling though). The cables were long enough to power my pedals even the ones at the ends of the board. Sound: Very quiet. Feature: Everything is useful. Ease of Use: N/A Quality: Product seems to be made well. Value: Not sure. Manufacturer Support: N/A The Wow Factor: If you use more than 1 pedal, you need this and a board. It is the only way to go. Overall: The unit works very well. I do have an issue with it though. When I received this and my Pedaltrain 2, I immediately started to install the unit on the underside of the pedaltrain. With the Pedaltrain 2, there are two knobs that protrude outward at the 7 & 8 inputs. This does not allow the power unit to be mounted underneath. I called zzounds and told them about this. Now maybe the pedaltrain was made slightly wrong, I just don't know. It is mounted on top. Style of Music: Rock, Blues, Classical.